The news report concerned Kasparov’s involvement with the Swiss company Audemars Piguet in the development of a clock for use in his upcoming match against Deep Blue. 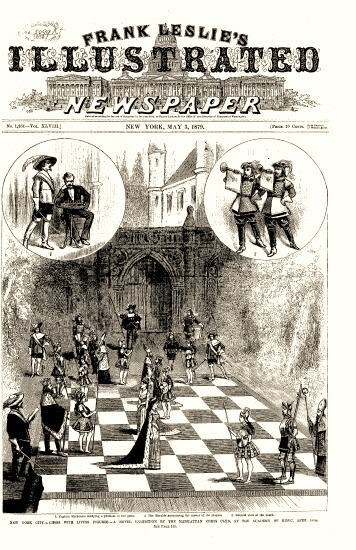 Mr Urcan mentions that the display was discussed, although without the above illustration, on pages 125-141 of Thomas Frère and the Brotherhood of Chess by Martin Frère Hillyer (Jefferson, 2007). 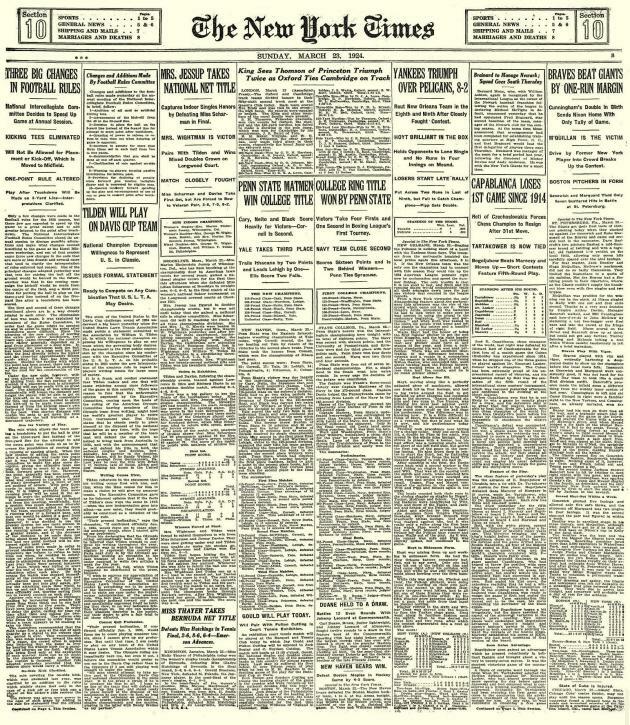 We recall that the picture was given on page 24 of the February 1931 American Chess Bulletin and that page 25 quoted the newspaper’s report on the game, which was played in New York on 16 April 1879. 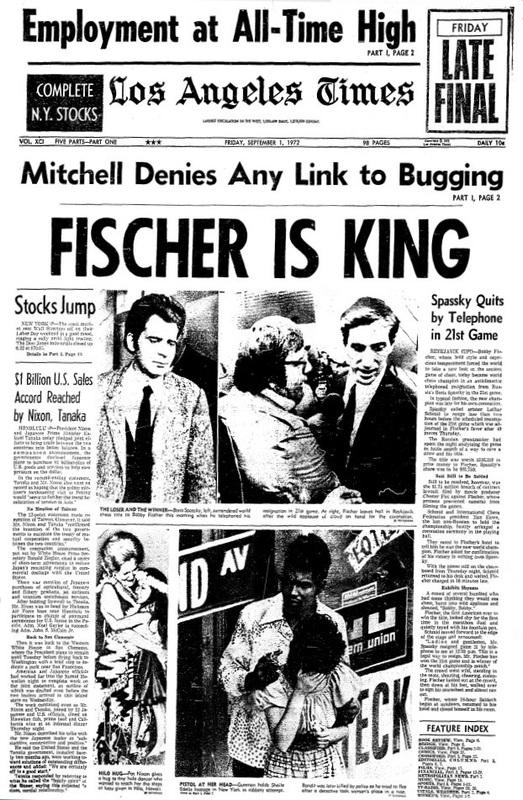 For Leonard Barden’s account of the episode, see pages 26-27 of CHESS, November 1997. 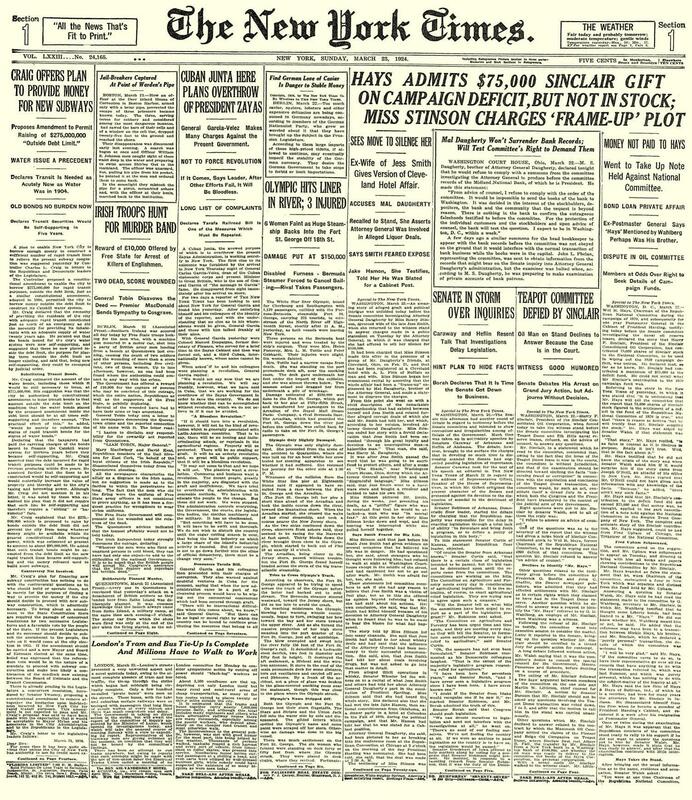 So, just how eye-catching was the newspaper’s front-page story on 23 March 1924, the day after the Cuban’s loss to Réti? 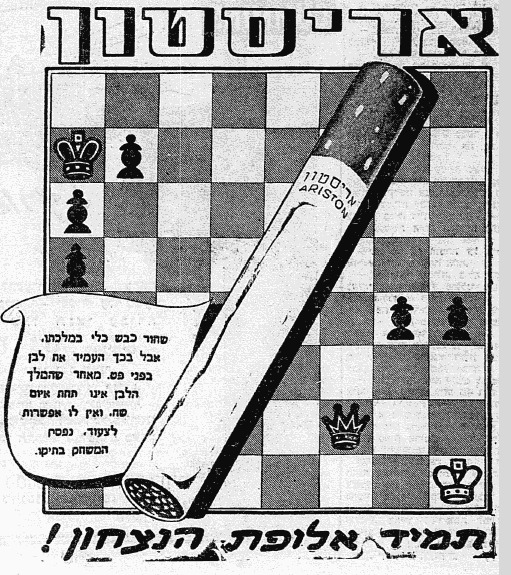 Contrary to the statement in the New York Times, the Cuban’s unbroken run (apart from the loss to Chajes in 1916) stretched back to his defeat by Tarrasch, and not Lasker, at St Petersburg, 1914. C.N. 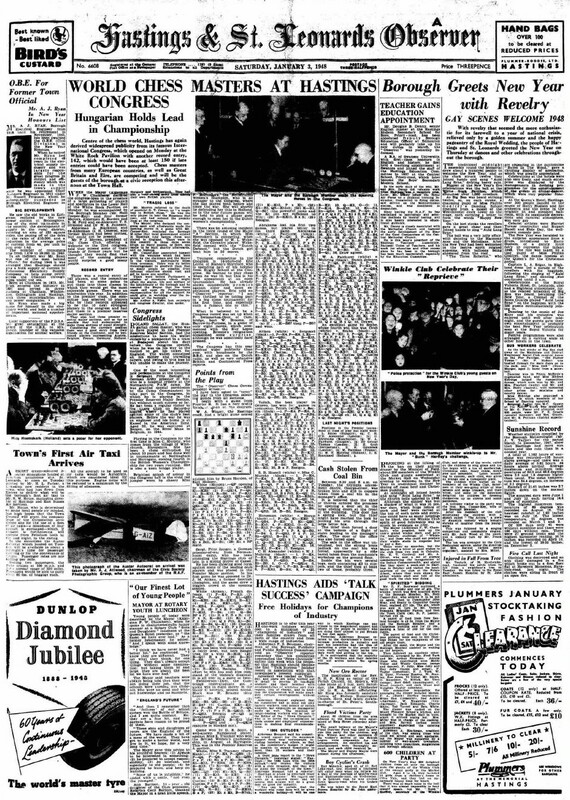 8205 showed the report of Capablanca’s loss to Réti on the front page of the sports section of the New York Times, 23 March 1924. 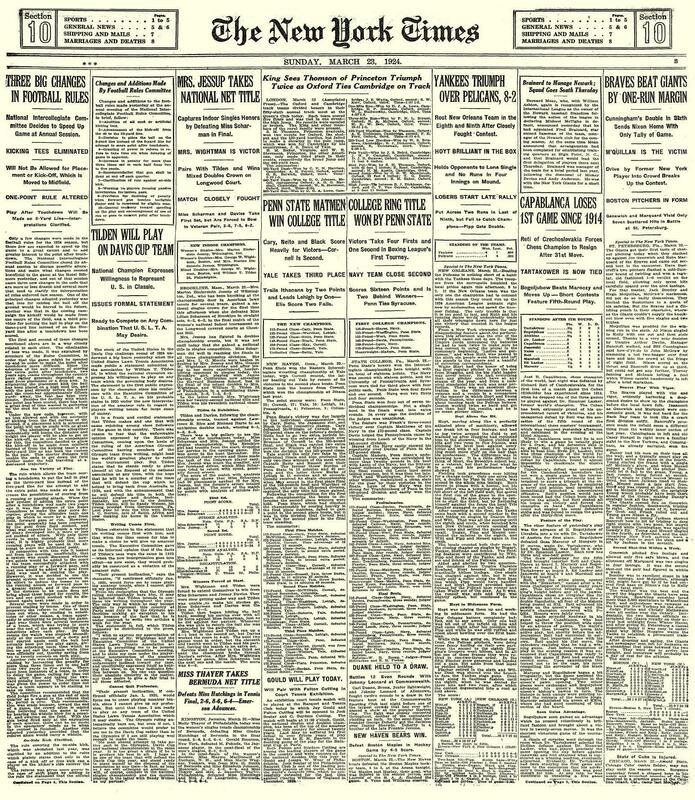 There was no mention of the game on the newspaper’s very front page. 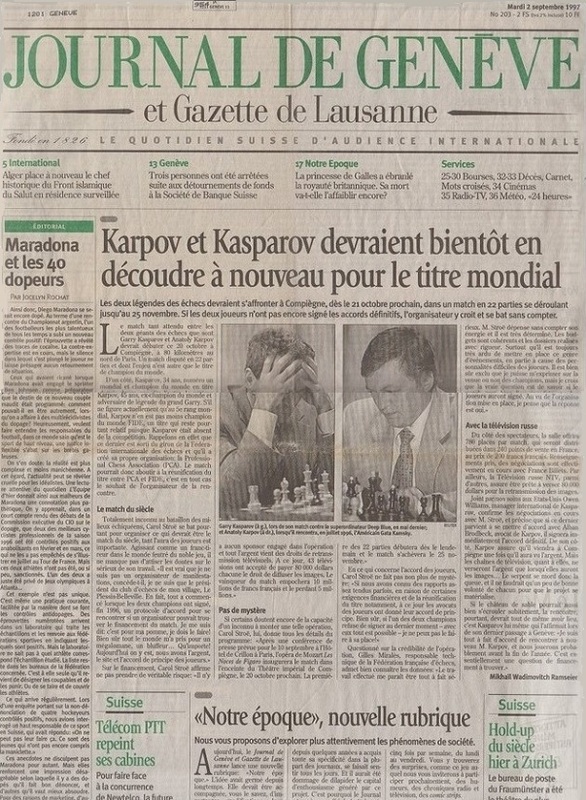 The report, by Mikhaïl Wadimovich Ramseier, affirmed that a FIDE/PCA reunification contest between Kasparov and Karpov (‘the match of the century’) was likely to take place in the Théâtre impérial de Compiègne, France from 20/21 October to 25 November 1997. 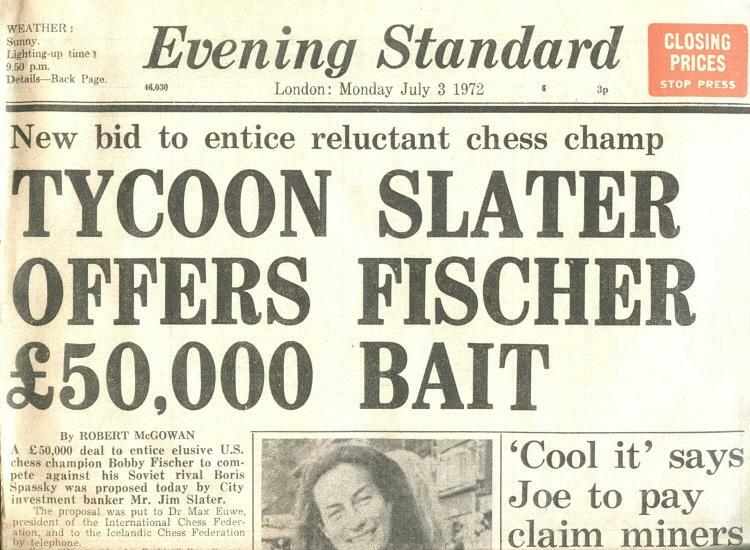 The organizer was named as Carol Stroë, the president of a village chess club (Le Plessis-Belleville), and he claimed to be putting forward prizes of ten million French francs for the winner and five million for the loser. There would be no sponsorship for the 22-game match. Funding would come from selling the pictures to 43 television companies for $80,000 each, and from audiences in the 780-seat theatre (200 French francs per ticket). 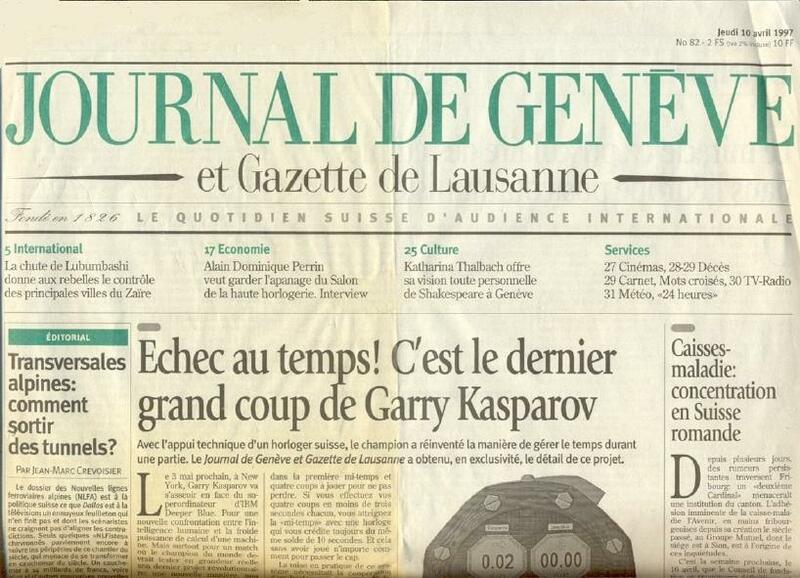 Following a statement from Kasparov’s representative, Owen Williams, a report on page 10 of the Journal de Genève, 6 September 1997 made it clear that the whole thing was off or, better say, had never been on. 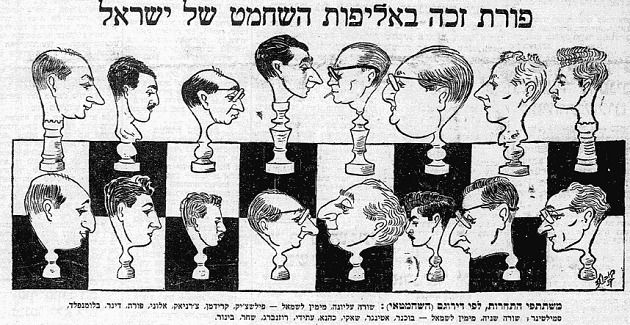 The caricatures by Buchwald are of all the players in that year’s national championship, in Tel Aviv, and below it is an article about the tournament by Eliyahu Fasher. 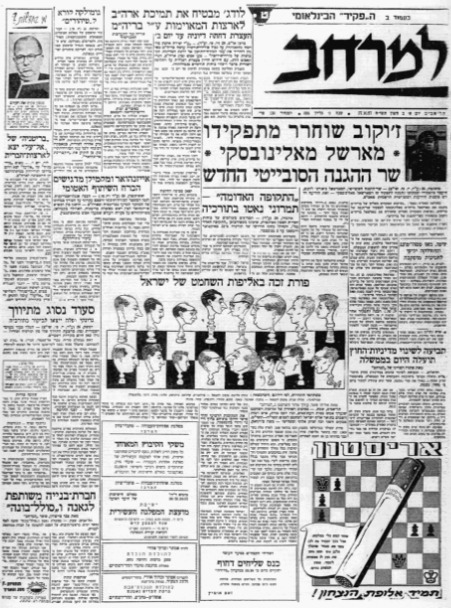 The headline reads, “Porat won Israel’s chess championship”. The players are (top row, from right to left) Pilschik, Kraidman, Czerniak, Aloni, Porat, Dyner, Blumfeld, Smiltiner and (bottom row, from right to left) Buchner, Etinger, Shaki, Kahane, Atidi, Rosenberg, Shahar, Binur. Latest update: 27 August 2018.